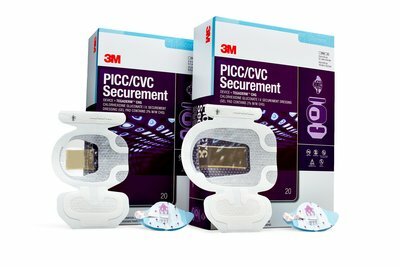 3M™ PICC/ CVC Securement Device + Tegaderm™ CHG Chlorhexidine Gluconate I.V. Securement Dressing is an engineered stablization device (ESD) plus antimicrobial (CHG) dressing designed to provide immediate and continuous antimicrobial protection for up to 7 days. Using a sutureless securement device is recommended by the Joint Commision. 3M™ PICC/ CVC Securement Device + Tegaderm™ CHG Chlorhexidine Gluconate I.V. Securement Dressing provides securement without sacrifice. Device measures 2 inch x 2-1/8 inch (5,1 cm x 5,4 cm) and dressing measures 4 inch x 6-1/8 inch (10 cm x 15,5 cm). 20 EA/box, 4 boxes/case.